The unspoiled condition and lack of modern amenities in Playa de Benijo can only add to its beauty. The solitude of this beach is enough incentive for travelers who want to avoid crowded spots on the island. 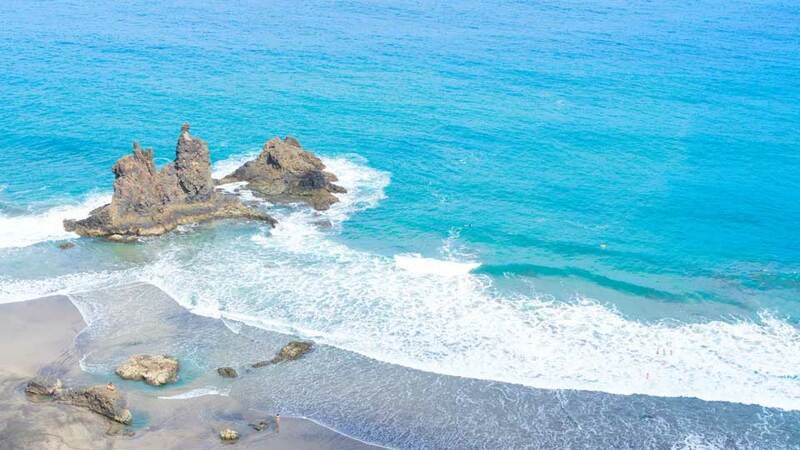 Apart from that, its unique sands and the splendid view of Roques de Anaga never fail to dazzle its visitors. The view on the way to Playa de Benijo is well worth the visit on its own. The road passes through a Lauri Silva forest with spectacular views of the Atlantic Coast. A section of steep terrain with ravines and peaks demands visitors to stop and take photos. Located in Anaga Rural Park (Parque Rural de Anaga), the secluded Playa de Benijo is one of the fascinating beaches in Tenerife. Lush flora covers the rocks behind the beach, which can be reached via steep steps. The surface is a large area of black sand with rocky areas mixed in between. The volcanic sand and pebbles covering the beach, as well as the rocks dotting the coastline and the cliffs, make Playa de Benijo a mandatory destination for landscape photographers. Although Playa de Benijo is the epiphany of untouched beauty, it resonates with a plethora of activities. The sea breaks on the protruding rocks causing the waves to pile up on top of each other. As such, this makes Playa de Benijo a great surfing spot, especially during the winter season. In the summer, the popular excursion destination is even better during low tide. The larger sandy beachfront makes for a more enticing attraction among holidaymakers and locals. The remoteness of Playa de Benijo makes it one of the best off-the-beaten-track spots on the island. However, the long drive to the beach makes it only an alternative among visitors. Regardless, the serenity of this less crowded paradise makes it an excellent place for meditation and relaxation. The pristine beauty of the Anaga Mountains bowing down to Playa de Benijo is a delight to witness up close. It also makes for a great hiking spot for adventure seekers. The route starts at the beach, following a path connected to the most important plantations in the Anaga area. The Guanches or the early people of Tenerife used to inhabit the area, enjoying the abundance of water and springs from the mountain. In the afternoon, the absolute magnificence of the sun bidding the Atlantic Coast goodbye is the kind that inspires poets and artists. 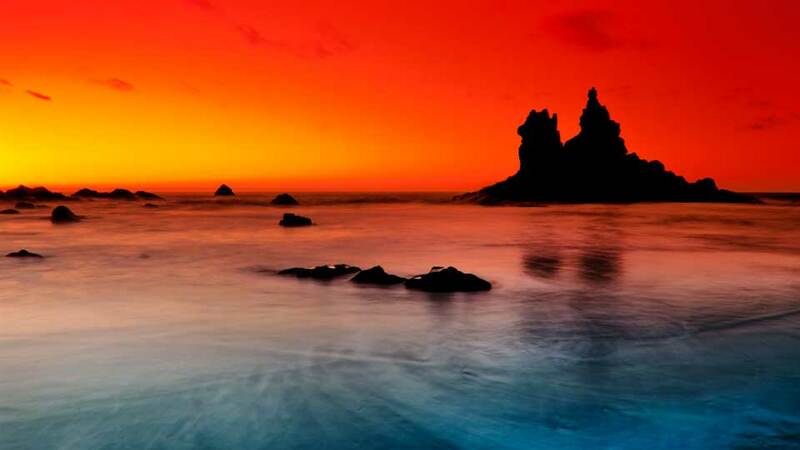 The glimmering sea contrasts with the red horizon and dark outline of the volcanic rocks rising from the depths of the ocean is pure magic. Traveling to Playa de Benijo is no easy task. The road that snakes up from San Andres and then down to Taganana is not for nervous drivers and passengers. However, the 180° hairpin turns, and the white-knuckle ride is all worth it. Jaw dropping sea and mountain view during the drive is a bonus for the brave souls who dare to visit. The easiest way to reach the beach is by renting a car. Visitors coming from Santa Cruz will have to go in direction San Andres. If coming from La Laguna, guests may go through Los Mercedes and Taganana, following the road to Playa de Benijo. Visitors driving on their own may use these GPS coordinates: 28.5721° N, 16.1925° W.
From Intercambiador de la Laguna, San Cristobal de la Laguna: Line 101 and 945. Travel time is approximately 200 minutes. From Los Cristianos, Arona: Line 470, 467, 343, 104, and 76. Travel time is approximately 690 minutes. From La Cuesta, San Cristobal De La Laguna: Line 14 and 945. Travel time is approximately 220 minutes. From Los Cristianos: Line 711, 934, 909, and 946. Travel time is approximately 410 minutes. From Intercambiador de Santa Cruz, Santa Cruz de Tenerife: Line 945. Travel time is approximately 200 minutes. There is a myriad of rustic restaurants near the beach where guests may enjoy a fantastic view and tasty food. Perched on a clifftop overlooking the sea, this restaurant is well-loved for its scenic view and good food. It offers a variety of seafood, Mediterranean, and Spanish cuisines and alcoholic beverages. There is a parking space available, and the restaurant accepts major credit cards. This restaurant is an often-overlooked gem in Benijo. From the road, it looks like an awning over some tables and a car park. But the tables under the awning have the most spectacular view of Playa de Benijo. La Venta Marrero serves delicious Spanish cuisines and is wheelchair accessible. Sitting almost at the end of the road is El Fronton Restaurant. Aside from outdoor seating which provides stunning views of the sea, this restaurant is also known for its excellent service. The food does not disappoint with its choices of seafood, Mediterranean, Spanish cuisines. If guests are looking for other options aside from these three restaurants, there are also a few more located a few minutes from the beach. Casa Africa – Bar Playa, Restaurante Pizzeria La Ola, Restaurante Los Pinchitos and Restaurante Roque Las Animas are all located within 3 kilometers from Playa de Benijo. The serenity of Playa de Benijo is one of the many reasons why it’s a must-visit when in Tenerife. The beach brings peace and solitude to its visitors and an ambiance that is not common in the rest of the touristy island. The view from the beach and its many lookout points are unreal, especially during the sunset. The unusual rock formations rise out of the water as if nature put it there for the delight of onlookers.